← Inspirations In Ink: Teatime in Paris! 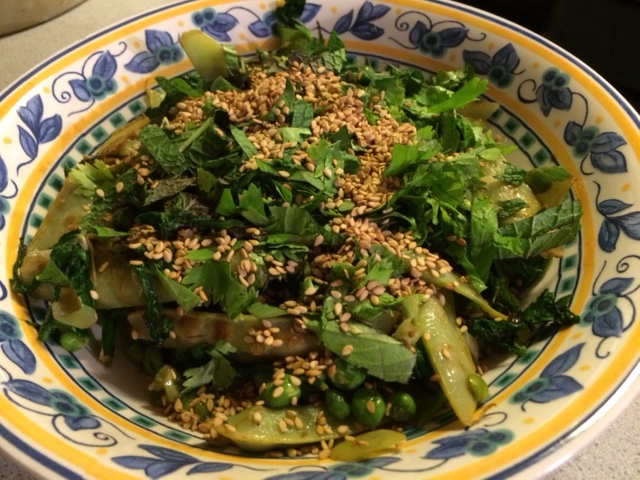 I can’t believe another month for Cottage Cooking Club has come and gone… This is the time of the month to share reviews of recipes I tried from Hugh Fearnley-Whittingstall’s River Cottage Veg in July. As in earlier months, I selected from the choices presented by our group’s leader, Andrea, The Kitchen Lioness, which always reflect ways to enjoy the most seasonal ingredients. The other members of the group (there are about a dozen of us) also choose from Andrea’s lineup and at the end of the month, we compare notes. I didn’t expect how hot July would turn out to be. In New England, we usually have about two weeks of unbearably hot and humid weather, typically one in July and another in August. Hazy hot and humid summers are the weather pattern that caused me to move away from my hometown in Maryland and never look back, at least not during the summer. It seems that with climate change, my childhood weather is catching up with me. Unlike in Maryland, here outside Boston, in our 150+ year old house, we are not equipped with central air. We suffer through with constantly whirring ceiling fans and floor fans, cold drinks, cubes of watermelon, ice cream, frequent showers, and visits to air-conditioned malls and restaurants. I’ll admit to spending my share of afternoons hanging out the public library too. Fortunately, I cooked my chosen recipe before July’s heat wave hit. The brilliantly-green Summer Stir-Fry with Fried Rice was beautiful to look at! I picked this recipe because I don’t typically stir fry, and I’m not sure why that is. Our backyard sugar snap peas petered out at the end of June, so I headed to the Wayland Farmers’ Market to stock up on ingredients. 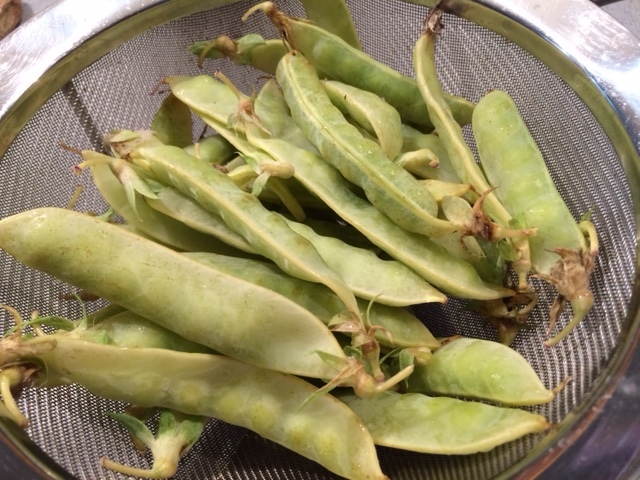 At the stand for Two Field Farm in Wayland, MA, my friend Charlie introduced me to golden snow peas. I bought a pint to add to sugar snaps, shelled English peas, arugula and scallions (I omitted the zucchini to accommodate Howard). Stir-fried rice with an egg scrambled into it forms the base for the verdant stir-fried vegetables. As lovely as this dish was on the plate, we found it “just OK”. Perhaps it needed more spice or we didn’t season it exactly to our taste. In any case, it was a fast weeknight meal, but not necessarily something I will make again. 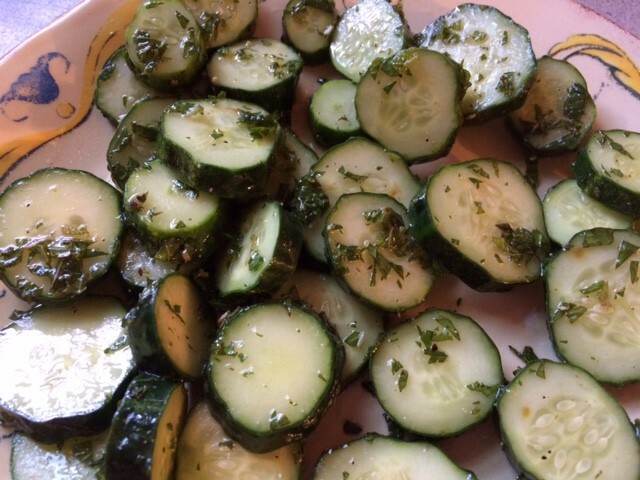 When the first of my cucumbers ripened, I decided to also make the Marinated Cucumber with Mint. No cooking required! Because my cukes were fresh off the vine, I did not peel or seed them. Other than that, I followed the instructions. The result was a light, bright cucumber salad. The fresh mint was a fresh touch. Like the stir-fry, this one was good, but not great. To date, my experience with Hugh’s recipes had been delightful, so I’ll admit that I was a tad disappointed this month to be underwhelmed by my choices. I will be interested in seeing what other Cottage Cooking Club members thought of their recipe choices (which you can see here). And, I’ll look forward to trying out another round of recipes from the August selections. Posted on 29 July 2015, in Cottage Cooking Club, Farmers Market, Summer and tagged Cottage Cooking Club, cucumbers, hot weather cooking, peas. Bookmark the permalink. 9 Comments. It was so hot during much of June and July here that I was barely cooking for quite a while. Luckily, it’s easy to eat fresh fruit and veggies without much recourse to the stove or oven. Now that things have calmed down, weather-wise (or, maybe we’ve just gotten used to it), I want to get back to CCC and TwD. The summer stirfry you made sounds especially nice and the marinated cucumbers sound intriguing. I’m looking forward to Andrea’s August selections, so I can get back on board with all of you! Hope you’ve been having a wonderful summer. I’ve been missing the weekly French Fridays check ins with everyone. Hello Betsy, great to see you as always. Sorry this months recipes didn’t float your boat, we liked the stir fry with extra added soy sauce and sesame oil. I did like the mint in the cucumber adding to the fresh flavor. I didn’t know you were from Maryland. We’ve many friends there and my youngest daughter lives in Baltimore. As far as cooking, I have been working so hard between making foods for the elders, ( my garage freezer is now packed,) and keeping up with the garden abundance that I am overwhelmed with photos and recipes and no time to put stories to them. Yikes. I’m feeling the pressure. Looking forward to seeing you over the month and at our juncture of CCC. Enjoy the remaining warm days of summer! Dear Betsy, that does not sound all that encouraging – but I understand about that heat wave – we suffered a terrible one at the begging of the month. You are growing so many vegetables – it is a delight to read all about them and your garden adventures! The month of August will hopefully be easier on everyone and hopefully the selections will tempt your palate a bit more. I can commiserate with you about the weather and we’re in for another hot and humid one today. Sorry you’re selections weren’t hits for you. I found the stir-fry a little dry and I think Peggy had it right when she added extra flavouring, and I also thought the addition of mint to the cucumber was a nice touch. There’s still lots of summer produce to come so I’m looking forward to August. Hi Betsy, we have been having a heat wave here as well, in fact we are on a level one drought alert, hard to believe. So sorry about your selections this month, I was very happy with mine. Have a great week-end. While we over in Malaysia is supposed to be going through a dry spell we have enjoyed a couple of heavy rain twice a week! Envy you for for all your new additions to this year’s kitchen garden! All well showcased in your selected recipes of Hugh’s! I didn’t realize it was so hot, hot, hot on the East Coast. (I know, I know, duh.) Of course Missy and the girls tell me all the time how hot it is in Cali. The heat can really drag you down. I think heat drags you down and snow, snow, snow just is depressive and stifling to the spirit. You’ve had more than your fair share of both this year. Miss you, my friend. I understand why these probably weren’t your favorite dishes. The stir-fry did need a bit more soy sauce, as Peggy suggested, but you are taking on additional sodium with that. The mint was a strong flavoring for the already strong-minded cucumbers. Although this will not be my favorite way to serve cucumbers, it is a different take on the veggie. I liked it more when it was finely sliced and used in my veggie sandwich. Try the grilled artichokes. I don’t have a grill, of course, they aren’t allowed at The Gant but I used my grill pan and electric stove! Delicious but would be even better on a real grill. On to next month when I know there will be more recipes to your and Howard’s liking. Glad you’re enjoying your responsibilities at the community farm and with the seed library. Both sound very interesting. The seed bank in Iowa is a real jewel in the state’s crown. Speaking of Iowa, Liz & Family are going to be here on Sunday for a few days. Will share pictures. Oh yuck for your weather! It’s even been humid on the opposite coast–something that is generally unheard of. We, too, aren’t prepared for that kind of weather and it’s so hard to cook (or do much of anything), right? Yeah, those 2 dishes weren’t my favorite either. I mean, the cucumbers especially weren’t really “my bag” and I love cucumbers. The stir fry was a bit pedestrian, but I liked it for quickly using up a ton of veggies. I always forget about stir fry as well and need to add it more to my repertoire. Other than that, I really enjoyed hearing about your garden! What fun to expand it this year and enjoy some more homegrown produce! I love stir-frying – it is my go to method of cooking. This one looks like a great stir fry. 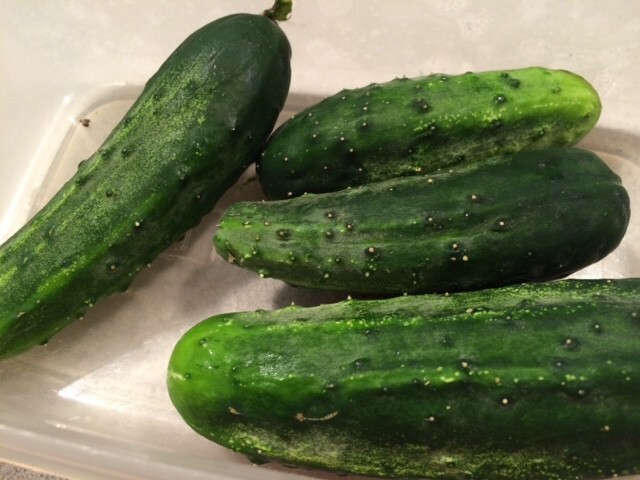 Your cucumbers look amazing.